It’s not always easy to tease out the deeper ideas hidden beneath the crazy surface, but one theme Aira works on is memories and forgetting. In his initial rambling monologue, the writer touches on these ideas, recalling(!) several mistaken memories from his childhood. He remembers his mother being asleep when he went to bed, even though he’s sure she was always up later than him, and his memory of being waken by birds turns out to be mistaken (it was his neighbour’s car). Writing was something he couldn’t do in a single block, all at once. He had to keep doing it, if at all possible, every day in order to establish a rhythm… The rhythm of publication, so checkered due to the imponderables of the material aspects, could be regularized through the installment format, which also took care of the quantity of the product and its basic tone, that of “disclosure”. Hmm – an author who writes every day and brings out regular short works… Remind you of anybody? 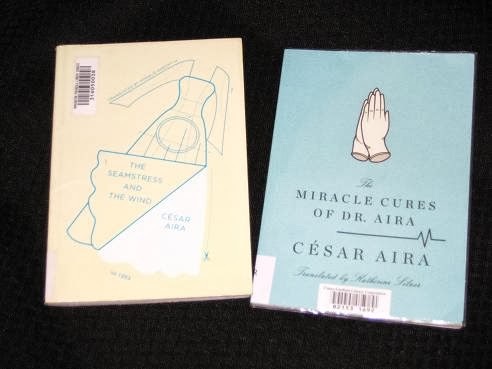 I may be completely wrong, but it seemed to me as if Aira was equating the struggle and mystery of producing a great work of art with the art of the miracle cure (or vice-versa). Just as in the creation of a work of fiction, the good doctor tries to bend the universe in his own fashion; more importantly, just as is the case in writing, it can all go horribly, horribly wrong. I am very much intrigued by the contradictions in the first of these titles Tony – great reviews. I went looking for César Aira's work after reading about him in the Guardian article The Publisher's Year: Hits & Misses of 2013, Simon Prosser Publisher at Hamish Hamilton mentions his work as Our book that deserved to do better. Sadly, too many of the books mentioned in this category tend to be translated works. clairemca – New Directions have really pushed him in the US. He's the next big thing in Spanish-language lit there after the success of Roberto Bolaño (and with most of his books being novellas, and plenty of them, they're being pumped out quite quickly in English). Hooray! Another Aira convert. I started out with mixed feelings regarding The Miracle Cures (and Varamo, for that matter) as I read, but it's grown on my slowly and surely. Because they are so short I try to ration out my Aira books. I'm on vacation next week and plan to delve into The Seamstress & the Wind and, possibly, The Hare.